Donkey Kong's Crash Course is a minigame that appears in the game Nintendo Land for the Wii U. 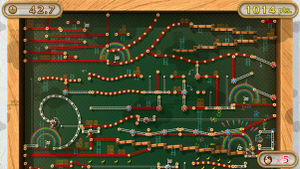 This game is single player and requires the player to navigate through a maze-like level in a small contraption. It's played by tilting the . A larger version of roughly half of the map is displayed on the television screen, whilst a view of the player is shown on the GamePad. The gameplay is most likely inspired by the Mine Cart levels in the Donkey Kong Country series, and the background is based on the original Donkey Kong. There are four courses in total - the first is red, the second is blue, and the final two are more difficult versions of the first two that have elements of the course missing or changed. The player is awarded an extra life every 2000 points. As with the rest of Nintendo Land, gameplay hints and tips are revealed by Monita as the player plays. In this game, she most notably encourages the player to keep an eye out for shortcuts. Therein lies the secret to getting high scores in this game. Donkey Kong's Crash Course was going to be based on either the Excitebike or 1080° Snowboarding franchises. While the theme and music is based on the original Donkey Kong arcade game, part of the music is based on the Cranky's Cabin music from Donkey Kong Country. This page was last edited on November 27, 2018, at 06:10.